Jurys Inn Hinckley Island HotelThis family friendly hotel, part of Jurys Inn Group, provides the facilities and service you would expect from a Jurys hotel; FREE PARKING, FREE WIFI, great choices for dining with a Piazza Lounge, contemporary Triumph Bar plus Marco Pierre White Steakhouse & Grill to choose from. Children’s meals, high chairs and cots are provided all year round. All of our executive family rooms consist of 2 double beds. DUE TO LIMITED AVAILABILITY WE CAN ONLY OFFER EXTRA BEDS TO FAMILIES WITH MORE THAN 2 CHILDREN AT PEAK TIMES. Please state on your booking if you wish to request a cot. Our leisure club consists of a newly refurbished pool, sauna, jacuzzi, steam room & fully equipped gym with Precor equipment, all children must be accompanied by an adult & during busy periods.Please note that over weekends and school holidays an hourly booking system for the swimming pool will be in operation. Please contact the hotel Leisure Club for more details. Pool opening times: Adults - Mon to Thurs 6.30am to 10pm, Fri 6.30am - 9pm, weekends and Bank Holidays 8am - 8pm. Children - Mon to Fri 8.30am - 11.30am and 3pm - 7pm, weekends and Bank Holidays 9am - 6pm. As the winner of the Leicester & Leicestershire Excellence In Tourism Award in the Access for All Category we are passionate about making our hotel an accessible place for all. We have bedrooms with wetroom bathrooms, a hearing loop, anti-allergy bedding on request and have deafgard pillows & reading glasses available for guest's use. If you have any specific questions regarding accessibility please do not hesitate to contact us. To book a Stay Play Explore Short Break at the Hinckley Island please visit www.stayplayexplore.co.uk and follow the booking process with Hinckley Island as your chosen hotel. Family fun - Leicestershire: Choices of days out include Twycross Zoo, Stonehurst Family Farm and Twinlakes - and lots more exciting attractions. 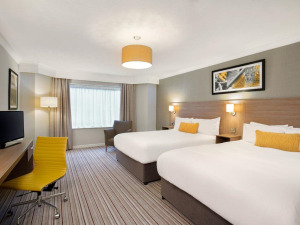 This family friendly hotel, part of Jurys Inn Group, provides the facilities and service you would expect from a Jurys hotel; FREE PARKING, FREE WIFI, great choices for dining with a Piazza Lounge, contemporary Triumph Bar plus Marco Pierre White Steakhouse & Grill to choose from. Children’s meals, high chairs and cots are provided all year round. All of our executive family rooms consist of 2 double beds. DUE TO LIMITED AVAILABILITY WE CAN ONLY OFFER EXTRA BEDS TO FAMILIES WITH MORE THAN 2 CHILDREN AT PEAK TIMES. Please state on your booking if you wish to request a cot. Family friendly hotel. Free parking. Free use of newly refurbished leisure club. Free wifi Children welcome from any age. From the North & East - Take Junction 21 of the M1 onto the M69. Exit at the second junction which is junction 1 signposted Hinckley/Milton Keynes A5. Turn left at the slip road onto the A5 and you will find the hotel 300 metres on the left. From the west - Take junction 2 of the M6 and follow signs to the M69 north. Leave at the first Junction which is Junction 1, signposted Hinckley/Milton Keynes A5. At the bottom of the slip roads take the 4th exit onto the A5 on Milton Keynes and you will find the hotel 300 metres on the left. Our fire alarm can be connected to hearing aids via the loop system Our fire evactuation procedure regarding disabled guests is that a member of staff will go to the bedroom/conference room of a disabled guest & personally help them to evacuate the building.